Miles Morales, Spider-Man, in his own book, not written by Brian Michael Bendis. Times they are a changin’. I was looking forward to this one for more than just an awesome cover by Kris Anka. Bendis’s time with Miles had, in my opinion, held back his own great idea for so long. I was excited to see what life a new writer could breathe into it. Sadly, what I walked away from this issue with instead was a simple statement: Marvel has no idea what to do with Miles Morales. Mild spoilers to follow. That statement is mainly referring to the confusion I found myself in when trying to figure out what exactly the main story in Spider-Man Annual #1 is supposed to mean for the web head. It’s sort of a rewriting of his origins as a superhero, and I suppose this plot could have worked given a few more pages, but what we actually got just wasn’t believable. I didn’t buy it. It tries to tell a story about a huge moment in Miles’s life that he and Ganke just never brought up, explaining the REAL reason he stopped being afraid of his powers and started being Spider-Man. Problem is, the person he loses off panel just isn’t around long enough to care. Not to mention, Peter’s death being the trigger for Miles’s superhero career is for many people what made his story so interesting, so if they’re trying to write that off, I don’t think anyone is going to go for it. Unless this is supposed to take place after Rio died but before Miles started being Spider-Man again, but he seems to be not at all surprised to see Peter Parker show up as Spider-Man… and Miles would remember Earth 1610… 616 Thor shows up. Plus Aaron is still around. The more I think about it, the harder it is to make any sense of it. Case in point: Marvel has done way too much with Miles in such a short time frame. They need to take a minute to breathe and really think about what he needs. 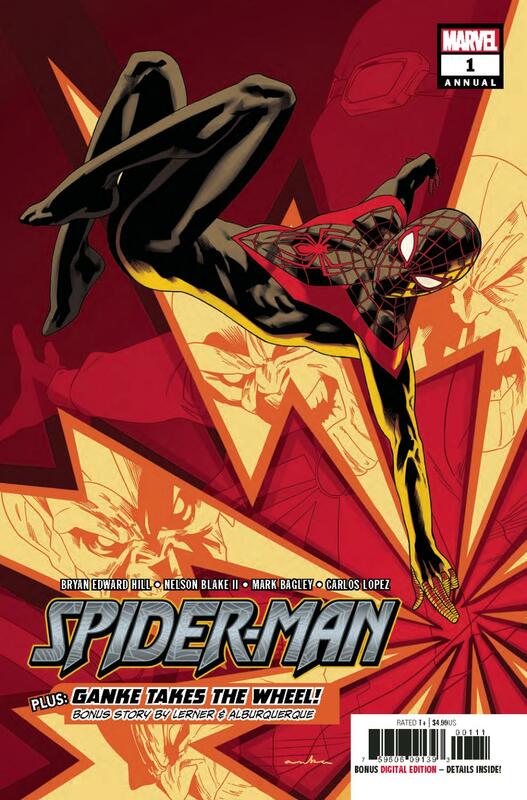 All of that could be ignored if the stuff in between it all were entertaining enough, but Miles is written as an incredibly angsty teen half the team and it’s quite distracting. He’s had his low points but he’s never been a, “the world is a cruel place ugh I’m so not happy with the world,” kind of guy. It feels inconsistent. Some conversations just seem to skip important steps to move things along faster. As for the B-story, it’s short even for a B-story and forgettable. Ganke is taking his driving test (and Miles is allowed in the car with him and the instructor for some reason? ), a car chase goes by, Miles stops it, ends on a joke that I guarantee you’re not going to laugh at. That’s all, folks. It’s got more fellow kids dialogue, which is always a huge point deductible for me. I would’ve preferred they just cut these pages and dropped the price a little. The visuals are certainly the highlight of the issue for me. Seeing Mark Bagley draw Miles Morales Spider-Man is just neat. His present-day action panels are by far the most engaging in the book, thanks to some cool angles and perspectives that emphasis the agility and acrobatics that make a Spider-Man fight so unique. Nelson Blake and Alitha Martinez do a solid job on their section, but they never really wow you. Alberto Alburquerque unfortunately bogs down the B-story some more with some really weird anatomy and panels that feel way too crowded way too often. All the artists do a good job with body language, but that can only do so much with a script that fails to elicit any kind of reaction.